Getting The Bounces. Sure, you make your own luck. But this time, the ball started bouncing Nebraska’s way. The best example was at the end of the first quarter, with Nebraska up 14-7. Nebraska faced a third-and-four, and fullback Andy Janovich fumbled the ball. Given the way Nebraska’s fortunes had been going, this would have been an opportunity for Minnesota to get the turnover, score on the short field, and put more pressure on the snakebit Cornhuskers. But this time, the ball bounced right back into Janovich’s arms, allowing Nebraska to not only retain possession but fall forward for the first down. Finally, it seemed, the worm had turned in Nebraska’s favor. There’s a couple of interesting things to observe here. First, Armstrong’s passing attempts have been consistently decreasing, likely an adaptation of head coach Mike Riley and offense coordinator Danny Langsdorf to Armstrong’s skill set. Second, and more interestingly, is how completion percentage correlates to success. When Armstrong is completing more than 60 percent of his passes, Nebraska wins. Less than 60 percent for Armstrong, and Nebraska loses. Correlation isn’t causation, but at this point it’s fair to say that Nebraska’s is keyed on Armstrong being accurate with the football. The Courage Of Your Convictions. Here we go again. Against Illinois with a critical third down to ice the game, Nebraska put Armstrong on a roll-out. He threw an incompletion, and gave Illinois enough time to win the game. Against Wisconsin (as observed by a smart and particularly handsome analyst), the ghost of that play haunted Nebraska. With another critical third-down conversion, Nebraska ran three times straight into the teeth of an eleven-man Wisconsin front, giving the Badgers possession and time to win the game. Instead, Armstrong dropped back and completed a 27-yard pass to Jordan Westerkamp, getting a first down and keeping the drive alive. Nebraska would eventually kick a field goal, stretching its lead to 41-25, and leaving Minnesota only 3:03 left for a two score comeback. While fans’ reaction to the pass call was mainly NONONONONOYESSSSSSSSSSS, Riley should be commended for having the guts to make the pass call. Against Wisconsin, the decision to run up the middle was coaching not to lose. Against Minnesota, even with all the heat he would have caught had it not worked out, Riley trusted his offense and his quarterback – and was rewarded for his courage. No Hiding. We’ve talked before about how Nebraska’s struggles in the secondary came in no small part from a lack of a pass rush. Well, that wasn’t the case against Minnesota. Both with a four-man rush and with a blitz, Nebraska heated up and harassed Minnesota quarterback Mitch Leidner for most of the game. Leidner – who came into the game completing 57.8 percent of his passes – went 26-40 for 301 yards passing. Minnesota’s previous best game passing this season was 264 yards – against Ohio. Numbers can, indeed, lie. But there’s no escaping the conclusions from both the statistics and from watching the games. 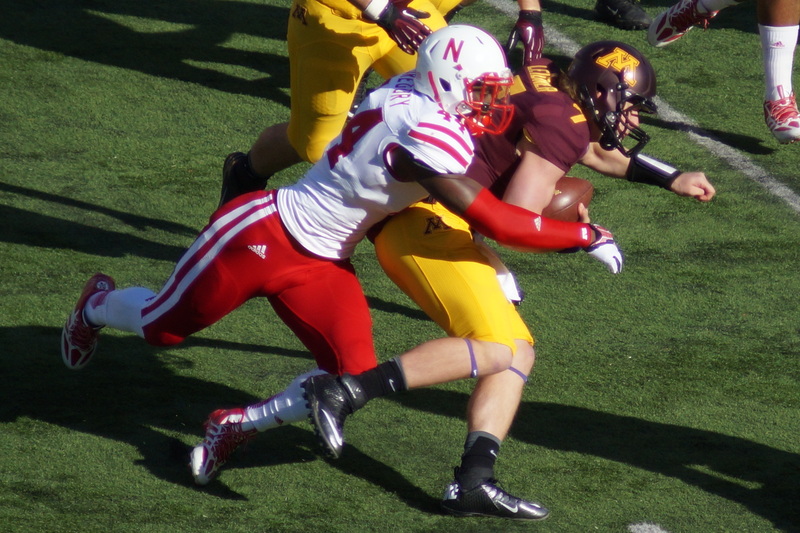 Nebraska’s secondary is a huge liability, one that was overcome against Minnesota. But absent a massive improvement going forward – which is not reasonable to assume being seven games into the season – then Nebraska will struggle throughout the 2015 season. A Work In Progress. The return of De’Mornay Pierson-El is without question a huge boost for Nebraska’s offense. His first punt return, a 42-yarder, reminded Nebraska fans of just how dangerous he can be. His tip-drill touchdown reception to help win the game for Nebraska is a glimpse of what the offense will look like with him as a participant. But he’s not the complete package yet. Twice, he let fieldable punts hit the ground, allowing Minnesota to stick Nebraska with horrific field position. Whether it’s a combination of rust and skittishness from his muffed punt against Illinois last week, Pierson-El has to make better decisions in terms of fielding punts deep in his own territory. Helping The Enemy. Let’s start with the obvious – beating Minnesota was a very good thing for Nebraska. But it may have the inadvertent effect of putting the B1G West out of reach. Iowa is 3-0 in conference play, in comparison to Nebraska’s 1-2. The Hawkeyes’ remaining schedule is Maryland, at Indiana, Minnesota, Purdue, and at Nebraska. Given what Iowa has left, it is entirely possible – even likely at this point – that Iowa will be undefeated coming into Black Friday against Nebraska. With a two-game lead and a soft schedule, Nebraska’s defeat of Minnesota may have gone a long way in guaranteeing Iowa a trip to Indianapolis. You all know what a big deal it was for Nebraska to get off the schneid and save its 2015 season. So let’s take this time to focus on what’s really cool about this game. When Nebraska came into the B1G in 2011, its game with Iowa was anointed the “Heroes Game” with an associated focus-group-approved Heroes Trophy. Last year, for reasons known to absolutely no one, the Nebraska-Wisconsin game was saddled with the ridiculous sailboat-like Freedom Trophy. Neither of these trophies have any of the personality or charm of trophies like Floyd of Rosedale or the Old Oaken Bucket. No more. Nebraska and Minnesota are now playing for the Bits of Broken Chair Trophy. The idea was born on Twitter between Minnesota’s mascot, Goldie, and Nebraska’s favorite parody coach account, @FauxPelini. Hey @FauxPelini, how about a friendly wager for this weekend's game? Team that gets the most points gets a conference win? Seem fair? Welcome to the B1G, Nebraska. Finally. ← Agony Analyzed: How Close Is Nebraska Football to Being 6-0? Riley’s been talking for a while about needing concrete proof that his system is working here, hopefully that trophy serves as that proof, as silly as it is. You often hear coaches talk about how winning trophies, even silly ones, can really impact the mindset of a team, so hopefully we see that. The margin for error is razor thin right now, but I still think 7-5 is a realistic goal. Iowa’s playing really well right now, but I think they’re going to find the game in Lincoln more difficult than some might assume. Their QB doesn’t seem to be anything special (yet), his stats are actually worse than Armstrong’s, and as important as Tommy’s play is to the Huskers, I don’t think he’s keeping defensive coordinators up at night. Iowa’s defense allowed Iowa State to roll up 17 points and 244 yards in the first half. And yes, it’s true they made some adjustments to post a shutout in the second half, but that’s still a shocking number given how starved for talent ISU is. If Nebraska plays stout against the run, like they normally do, we’ve got a chance. I’d be really interested to see what the line for Iowa-Nebraska would be this week. I keep wanting to dismiss Iowa, but it’s getting harder and harder to do so. Yes, the Hawkeyes’ best win is against Pitt — but that’s a 7-1 team that might be sneaky-good. Iowa State gave TCU a game for a while, too. Paul Rhoads is a really good football coach, but not a good enough recruiter to get competitive talent in Ames (which, in fairness, just means that he’s not a sorcerer who drinks the blood of the living. You know, like Bill Snyder.) Iowa-Iowa State games are always competitive, it’s the nature of that rivalry. I wouldn’t put too much stock in that result. Iowa’s got a solid defense, a playmaker at quarterback in C.J. Beathard (although I agree I would take Armstrong over Beathard), and enough talent at the skill positions to make life difficult. I’d be shocked if Iowa wasn’t 11-0 coming in to Lincoln, which would make for a fascinating game. Oh, and I forgot to add, I agree completely with what you said about trophies. Winning begets winning, and a social-media-created trophy like the Bits of Broken Chair (BOB-C?) might actually be more meaningful than the ridiculous ones Nebraska has been playing for.